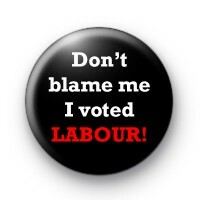 Dont Blame me I Voted Labour Badge. I supported Jeremy Corbyn in the 2017 General Election not the Conservatives. Anti Theresa May & Pro Labour and Corbyn.